Daily Cheapskate: STELLAR deal on Cottonelle Ultra GentleCare toilet paper on Amazon: 34 cents per double roll! STELLAR deal on Cottonelle Ultra GentleCare toilet paper on Amazon: 34 cents per double roll! 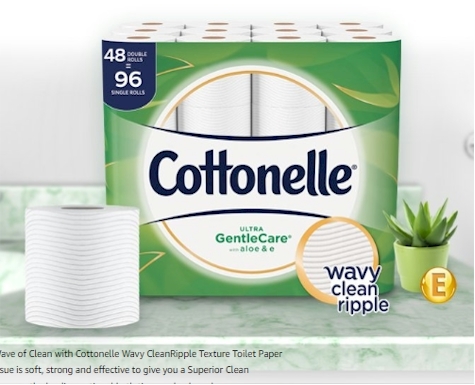 This is an absolutely STELLAR deal on Cottonelle Ultra GentleCare toilet paper, as low as 34 cents per double roll (my buying threshold is 50 cents for a single roll) when you stack a $2.00 coupon with Subscribe & Save discounts. $18.26 - $2.00 coupon = $16.26 (34 cents per double roll) with the 15% Subscribe & Save discount if you can take delivery of 5 or more active subscriptions in one month. $20.41 - $2.00 coupon = $18.41 (38 cents per double roll) with the standard 5% Subscribe & Save discount.